Let me say from the onset that this is not a Bartolini family recipe. In fact, I can say with some certainty — feel free to back me up, Zia — that beef cheeks never graced a Bartolini dinner table. This all changed the last weekend of last October. That was the weekend the vendor with certified organic meats returned to the farmers market. You may recall that I had been waiting for him to return because he sold goat and, even though I’d found some at a nearby market, I prefer to buy organic when its available. As it is, I buy chickens from him all Summer long. It had been weeks since he last set up his stall and I was, frankly, surprised to see him. The following weekend was to be the market’s last for the year and I thought him gone until 2014. His stall, for lack of a better word, is a set of folding tables arranged in a “U” shape. On them he’s places about 6 ice chests in which he keeps the week’s frozen inventory. That week there wasn’t any goat meat but I was surprised to find a package labeled “beef cheeks.” I bought it, along with a chicken, and placed both in the freezer when I returned home. Well, as this Winter unfolded, I exhausted my repertoire of comfort foods. Last week’s tuna noodle casserole was proof that I’d run out of options. It was about that time that I remembered that there were beef cheeks in the freezer, though they had somehow managed to work their way to a back corner. Another Sunday braise was suddenly in the offing. Although still below freezing, that Sunday turned out to be the warmest day of the month to date. Since there was no real need to heat the kitchen, I switched gears a bit and opted for using the slow cooker rather than the Dutch oven. Best of all, with a fridge well-stocked with braising vegetables, there would be no last-minute trip to the grocery that morning — until I realized that I’d need side dishes. Curses! This braise is like most, with one minor exception. I started by making a form of battuto, an Italian soffrito. In our part of Italy, a battuto consists of finely diced onion, parsley, garlic, and salt pork. Battuto is the first thing into the pan, after the olive oil is heated, and will flavor the dish as its aroma fills your kitchen. Here, I made my battuto with guanciale, parsley, and garlic. (Yes, this recipe mixes the cheeks of both pork and beef. Shocking!) The onions were added with the other braising vegetables, once the battuto was cooked. The rest of the recipe is easy enough to follow and you should have no problems. Combine chopped guanciale, parsley, and garlic on your cutting board and chop them together until uniform. This is the battuto. Warm oil in a sauté pan over med-high heat. Add the battuto and sauté until the guanciale’s fat is rendered, about 5 – 7 minutes. Do not allow to burn. Add onion, carrots, and celery to the pan and sauté until the onion is translucent. Add the rosemary and thyme to the pan. Continue sautéing until both begin to wilt. Use a slotted spoon to remove the pan’s contents and place all into the slow cooker. Do not drain the oil. Season beef cheeks with salt and pepper before placing into the hot pan. Turn when brown, about 5 minutes. Remove when both sides have been browned. Place into the slow cooker atop the other ingredients. Add the tomato paste to the pan and sauté until fragrant, about 1 minute. Add the Madeira and beef stock and bring to a boil to burn off the alcohol. Just before serving, garnish with a bit of lemon zest. As pictured, there were 2 sides served, neither of which is complicated nor difficult to prepare. 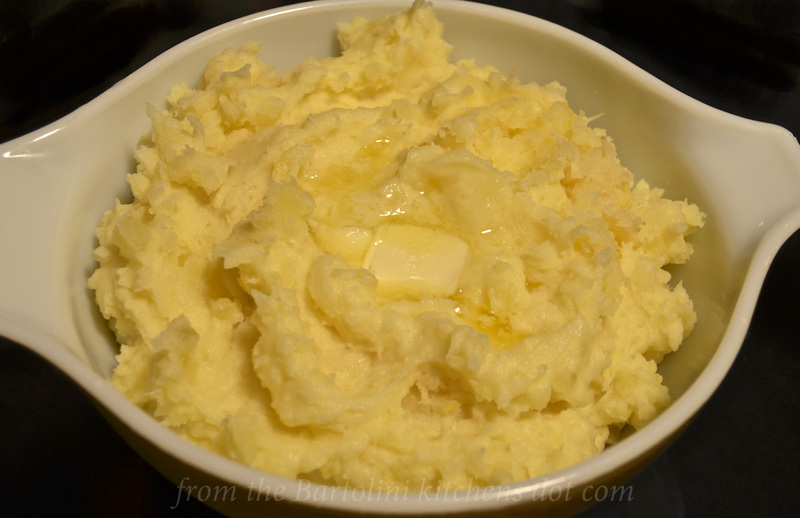 Prepare mashed potatoes as you would normally, substituting 1/3 of the potatoes with peeled, chopped parsnips. Once boiled and drained, mash before adding warmed heavy cream into which butter and roasted garlic cloves have been added. Serve. 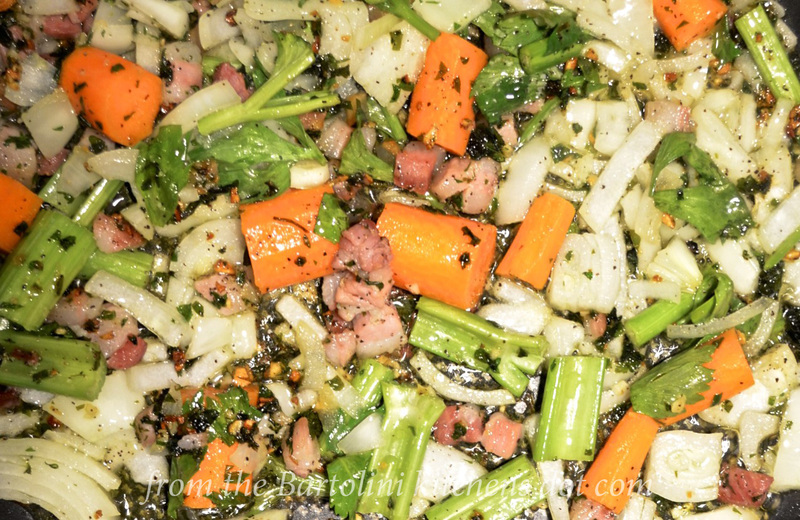 Sauté chopped pancetta in a bit of olive oil to render its fat and until it’s not quite fully cooked. Add garlic and, after about a minute, add the broccoli rab, season with salt & pepper, and sauté until cooked to your satisfaction. Serve. 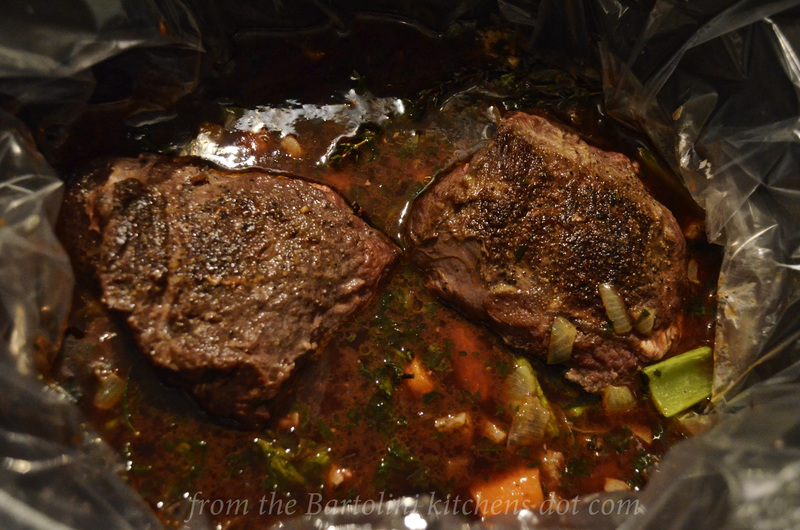 The braising liquid should not be so deep that the meat is totally submerged like you would do for a stew or soup. When using a slow cooker. the liquid should come about half-way up the side of the beef cheeks. When using a Dutch oven, I use enough liquid so that it comes up 2/3 of the side of the protein to allow for evaporation. Use more or less liquid to arrive at the recommended level. Just maintain the same ratio of the braising liquid’s ingredients: 2 parts beef stock to 1 part each of Madeira and red wine. A slow cooker works by applying a low, even temperature over a long period of time. Do not uncover the cooker unless necessary or you’ll run the risk of extending the cooking time. Parsnips are a bit more firm than potatoes. When preparing them, chop the parsnips in pieces that are slightly smaller than the potatoes to insure that all will finish cooking at the same time. use a thickening agent — flour, corn starch, or arrowroot — to make gravy. No matter how you finish the sauce, be sure to taste and adjust the seasoning as needed. On the very day that I was cooking my beef cheeks, Phil, of “Food, Frankly“, posted his recipes for preparing an ox cheeks dinner. Do yourself a favor and take a few minutes to check out the delicious meal that he prepared. In the Comments for last week’s post, my Cousin mentioned that there’s a recall of beef that was processed by a California company and sold across the US. Though the beef I purchased was locally grown and processed, that is hardly the case everywhere. You can read about the recall and the reasons behind it in this USDA News Release, dated February 18th, 2014. It won’t be long now before we are once again celebrating St. Joseph’s Feast Day. 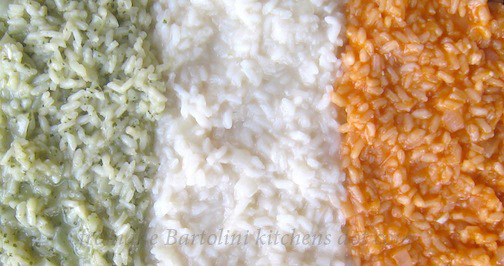 Today’s look back will show you how to prepare a risotto of 3 colors, each of which, not so coincidentally, corresponds to one of the colors of the Italian flag. You needn’t be Italian to make this expression of Italian pride and you can learn how to do it by clicking HERE. This entry was posted in Gluten-Free, Main Course (Secondi), Slow Cooker and tagged Beef, Cooking, Food, Italian, Recipes, Slow Cooker by ChgoJohn. Bookmark the permalink. I love beef cheeks and I do them in the slow cooker too. Long and slow and the meat just falls apart and is incredibly tender. I love how you did yours! Thanks, Maureen. They certainly were tender. It was a very enjoyable meal that night. Your beef looks delightful and must be very tender. I just had a delicious piece of 60 hr slow cooked beef at an Italian restaurant here in Germany last weekend when Thomas and I went out for a belated Valentine’s Day celebration. I dare say if I ever attempt to try slow cooked beef at home 6 hours in a slow cooker will definitely be my choice over 2 1/2 days of cooking! That does look wonderful, and I love your potato and parsnip mash with garlic and cream and butter. I’ve only just had breakfast and you’re making me hungry all over again. Thank you, Linda. Slow cooking is the way to go with these cheeks. The meat was fork-tender, just the way it should be. Now I’m hungry… I can almost feel the taste of slow cooked beef in my mouth. I love the side dishes!! Thank you!! 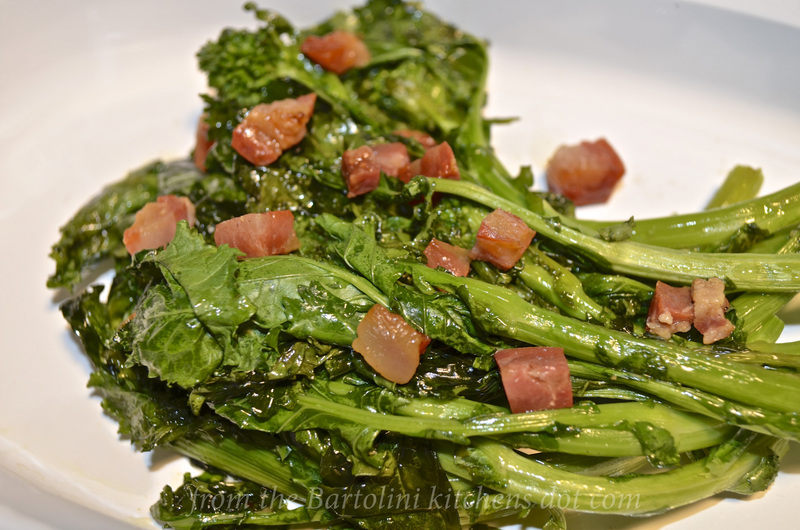 I LOVE cime di rapa, delicious with pasta (orecchiette, obviously), and “stufate” as a side dish. I don’t think I’ve ever cooked beef cheeks – probably because I’ve never seen them or hunted them down (metaphorically speaking of course, there aren’t many wild cows either Up Our Mountain or running along our beach Down by the Sea!). My mum makes pork cheeks in a similar way and the method you use is very much the way I cook oxtail. 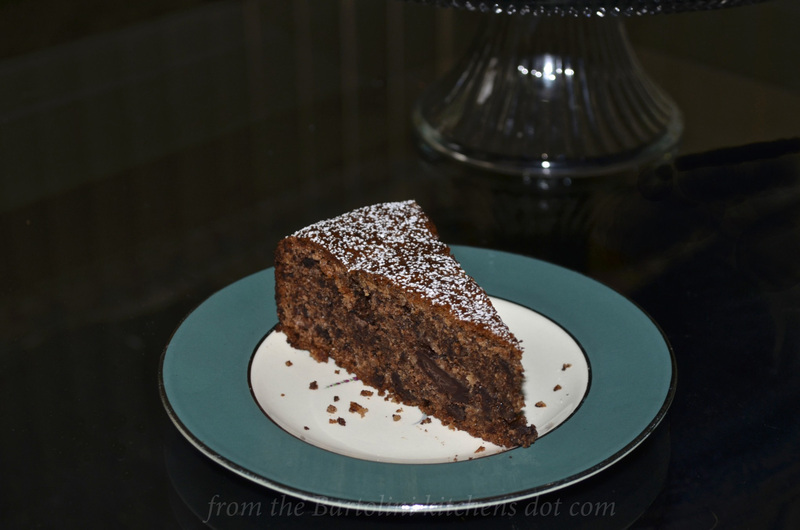 So….I love this recipe and am off to hunt me down a cheeky cow! Even when you learn the name, you may not find them so easily. Here, I have to special order them, unless my farmers market vendor has them. Once they’re featured on a cooking show, everybody buys them, the price goes up, and they become scarce. I hope you can find them. They’re delicious! Kaya would love my butcher. Open the door to his shop and a cow moos. Kids his age giggle whenever someone enters. Beef cheeks are one of those forgotten meat cuts in Italy people used to cook at the end of the Second Word War. Now Chefs of many important restaurants make guance di bue a very attractive dish. Thanks, Silva. Cheeks were an inexpensive meat here, too. Now, though, they’ve been “discovered” and the restaurants are buying most of them. If I cannot get them at the farmers market, I have to order them from my butcher. They are no longer inexpensive like before. So very much looking forward to our cooler evenings to come, where the aromas of casseroles, soups and braises (just like this one) will fill the kitchen once more! Such a delicious looking dish John! Thanks, Margot. I really do know what you mean, though, if I’m going to be totally honest, I cannot wait for a morning when I can open the windows and let some fresh air into my home. This winter seems interminable, even by Chicago standards. Great John – I actually have some left in the freezer (in fact I bought all the butcher had on display knowing how hard it is to come by) and fancy preparing it again having seen this. Thanks for the link, very kind of you, and the term ‘battuto’ – you learn something every day! You’re very welcome, Phil. I couldn’t believe the coincidence. It’s not like there are hundreds of beef cheek posts. I thought you did a great job with your cheeks, too, and that celeriac mash sounded like the perfect side. All in all, you presented a great looking dish and I was happy to share it. Another excellent meal. Cooked in a slow cooker makes it ideal. I can imagine the ingredients you use having the house filled with wonderful flavors. 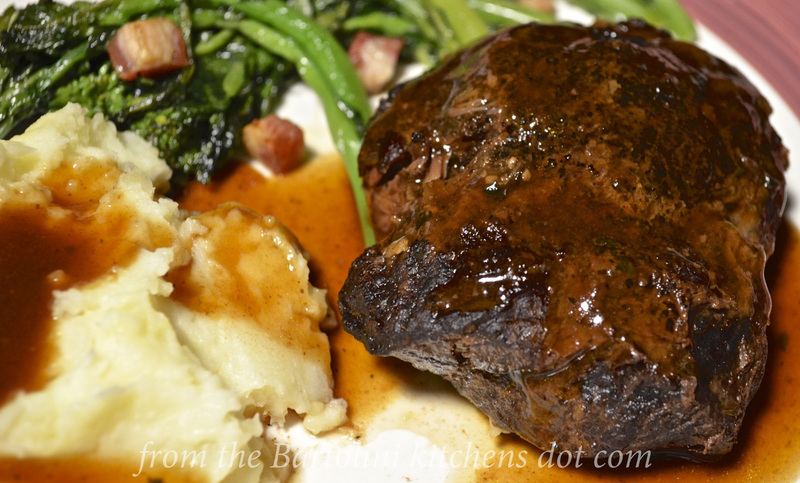 I must admit I’ve never heard of beef cheeks but that’s why I keep coming to your blog. I learn so much about cooking. Boy does that look good! Especially for our weather. I hope you are making out just fine. Thanks, Dave, this has been the Winter for comfort foods — and snowblowers, rock salt, etc. Luckily, it’s been pretty much uneventful around here and I hope you can say the same. This is not the time for furnace problems or power failures. C’mon Spring! This looks wonderful. The slow cooker is a great way to braise. I might have to check for beef cheek at the farmer’s market now. The sides look very tasty too, I love broccoli rab. Thank you. That one vendor was full of surprises last Summer. First he had goat and then beef cheeks. As I mentioned in the post, I aways bought chicken from him but never did I take a look at the contents of the other coolers. Not anymore. Now I’ll check them all every time I see him.Who knows what other gems he’ll have hidden there? Always good treasures at your local farmer’s market! I dream of my husband finishing his garage and moving all the tools out of my attached garage. Then I will have room for a deep freezer. THEN maybe I could finally look I to getting a full side of organic beef. I don’t think I ever had beef cheeks, although I ate a pig’s head in France a couple of times actually, it was interesting, but very heavy. Not sure I would order it again. now your dish seems absolutely perfect to me! Comfort food indeed – Looks fantastic! I think I can smell it now 🙂 You’re such a rebel too…beef and pork, lol! I bet that touch of pork added another layer of flavor perfectly. I’ll have to add beef cheeks to my list. Our local co-op has ground goat so I’m thinking of giving that a go. It’s local and none of the junk in it which is good. I’m with you on waiting for winter to pass and get out of the comfort food. Though this is very good comfort food! I bet ground goat would make a great burger! I have to look for that. As much as I’ve enjoyed these meals and their aroma filling the house, I want to open the windows and smell the fresh air again. It’s time for Old Man Winter to start looking for the way out of here. Time for the warm sun and flowers. Tired of wearing a ton of layers! Hello John, JT would love this dish, it’s exactly the type of food he orders when we dine out (except that yours would be better of course), I bet the meat was so succulent and tender. Tell me, is organic expensive in your parts? It’s ridiculous here; a couple of years ago I overheard a butcher tell a guy that his four organic chicken breasts were $60! The supermarkets have begun to sell “free from” and “humane” here which is much more affordable. Will you be posting pictures of your renovations? Temperatures are plummeting again, I’m looking forward to when the winter is over. At least our city thinks it’ll be soon, we just received notice that garden waste pickup will commence in three weeks! Have a great week. Most things bought at the farmers markets here in town are more expensive than in the groceries — unless it at peak season, like corn or strawberries or asparagus. The organic produce and meats are even more expensive. Still, I don’t find them ridiculously expensive. The organic chickens I buy are about $10 to $12.00. Those chicken breasts, at $60, were more than what we pay for veal ($17.00/lb). Sorry for th misunderstanding, Eva, but I’m not suffering through renovations. I am working on a couple projects here at home, though. This Winter just won’t quit! Tomorrow, Thursday, is supposed to be the worst of this cold spell and I hope it’s the last we see of temps this cold until 2015, if then. The snow blanket is still so thick here, and with my home facing West, I doubt all of the snow will be gone in 3 weeks unless we have some really warm weather — and that will mean flooding. It’s a Catch 22 of the worst kind. I hope yours is a good week, too! If only you could send us a little warmth. We sure could use it. We’re in single digits right now and aren’t supposed to get any warmer all day today. Brrrr. I think I can speak for many when I say Spring will not get here soon enough. Thank you. I love Firenzi, rain or shine. It is my favorite city in the World and I cannot wait to return. Oh you cheeky rascal you 😉 I must try that potato and parsnip mash since I know someone who really likes both. As it so happens I have some cheek of beef in the freezer. This would be a good time to try out your recipe. Nice when that happens. Thanks, Kristy, but I feel like I’m the Pied Piper of Carnivores, trying to lure you back to the fold. I actually give you guys credit for making the changes to your diets. You’re both looking great! At least you’ll enjoy the mash — and next week’s cake is a good one. Plenty of chocolate with that one. LOL – I like that, “the Pied Piper of Carnivores.” I made the mash that evening and the kids and I gobbled it up. 🙂 I also made sticky garlic chicken wings and ate them. (Mike wasn’t home.) I just can’t stick to the vegan thing like he does. I’d say I’m 4 out of 7 days without meat. Mike is more like 6 out of 7. It amazes me. Thanks again for the parsnip mash recipe! A Taste You Hate? Just Wait! Are there really foods that we don’t like, or just foods that we haven’t liked yet? If you’ve not tried beef cheeks, you will love them. When cooked nice and slowly, they are just as tender as can be. Thank you for sending me to that article. What a great read! I’ve an adventurous palate, though I draw the line at insects. I don’t care how tasty they might be, I just don’t want any. I love everything that you make John. Ah, slow cooked beef… the sides sound delicious too, particularly that creamy potato with parsnips and lots of butter. Yum! We’re not really eating comfort foods here in the heat but I’ll be saving this up for the colder months. Love the extra cooking notes that you’ve added in. Really helpful! I bet the torte will be sumptuous as well. Looking forward to it. Have a great Sunday. I love beef cheeks, but have never cooked them (I almost never see them at my usual markets). And I’ve never had a mixed cheek dish! Love your battuto — I’m so going to start using parsley like this. This is a great, simple dish. And a wonderful way to use my slow cooker, which I neglect far too much. Thanks for this. Thanks, John. You’re as kind and supportive in your comments as ever. I’ve not seen beef cheeks anywhere but in that vendor’s ice chest. If I want them, I have to special order them. The vendor’s cheeks, though, were very nice. They required no trimming at all. I’ll definitely buy more from him – if and when he has them. Great straightforward recipe, John! So far I haven’t prepared beef (or any other) cheek, as recipes usually include trimming, brining, parboiling and what not. Love the battuto as well as the sides. I was really surprised with the condition these cheeks were in. They needed absolutely no trimming whatsoever. Not only was this vendor’s meat very flavorful, it was very well-butchered. I’m looking forward to the market’s reopening in May so that I can see what else I’ve been missing in his ice chests. I love braised meats and this here looks so tasty! Great idea to add the Madeira and lemon zest. Thank you, Ronit. That bit of citrus zest — I’ve used lemon or orange — really works wonders. It adds a pop, a flavor accent, that you just don’t expect. “Big Night” was such a great movie. What a feast! I have never prepared any type of cheek! Your recipe ingredients look flavorful – and the cooking process straightforward and reliable. 🙂 I will have to give this a try… once you reveal your flourless/GF chocolate torte recipe! Love the photos, as well, John! Maybe I shall prepare both one evening – an ode to “fromthebartolinikitchens.com”. 🙂 I know Abba would love both; chocolate and beef are dear to both of our hearts. This does look delicious. Would your beef cheeks be the same as rump roast in the US? Thank you. Beef cheeks are just what the name says: the cheeks of the steer. Rump roasts come from the upper portion of the steer’s hind legs. The cheeks are a tougher cut than, say, the loin. That’s why braising works so well. It turns this tough cut into a succulent, tender piece of meat. I cannot speak for your area but here, in Chicago, I cannot find them at my grocer’s or butcher. I have to special order them. However, I was surprised to find a vendor at the farmers market that had them. Now I have to see if he has them regularly, or, was I just lucky that day. California is in for a couple of storms. Anyway, rainy weather makes me want to cook and bake. I love your recipe. We’re in for some storms until Sunday, so this is just perfect. I’ve seen the reports. It seems that our weather is going bonkers. Yes, there’s a drought in California but the last thing needed is drenching rains. Here, we’re having yet another “Polar Vortex”. Either weather condition screams for comfort food. Beef cheeks is a great way to go! Good luck during the storms, Arlene. Yes, that looks tasty. I smiled, noticing the carrots and celery in the ingredient list, as they both found their way into my rendition of your quail recipe yesterday. Looking forward to tonight’s leftovers! I can smell the aromas from this dish. I haven’t had beef cheeks since my mother made them & I’ve been trying to remember how she did them – couldn’t have been with the crock pot because that hadn’t been invented yet. It had to have been in the oven. And by the way, those mashed potatoes with the gravy – perfect! Thanks, Diane. Too bad you don’t have your Mother’s recipe. I’d love to see it – even prepare it. You can easily prepare these in the oven. Just be sure to add a little more liquid to account for evaporation and cut the cooking time to about 2.5 to 3 hours. You’re in for a real treat! Absolutely love slow cooked beef and this one sounds wonderful John. Sounded like you were describing a little vendor we have here at our local market selling organic, free range meats. Same “U” shape set up with ice chests and all. It’s wonderful to get your meat this way and it really should be the only way! Mmm delicious, I bet the kitchen tasted good while this was cooking. I’m a huge fan of slow braised meat, especially beef cheeks! I have a supplier, (tables at the farmer’s market with ice chests on top) who sells them. He uses the student butchers at the local college for his meat, that way he can be sure he’s getting back the beasts he has farmed. The only problem is the cheeks are often very roughly trimmed and it’s such a job to get rid of all the attached unwanted tissue, it puts me off buying them. I just mentioned in my last reply how nicely trimmed these cheeks were. They needed no further trimming whatsoever. I was really impressed — and very relieved. I’ll definitely be looking for more once the market opens in May. I don’t eat beef anymore John, but my husband would love an invitation for this dish and any others for that matter! Beef cheeks seem to be all over every menu out there so you are following the trend. Not that that matters, but so hip you are with this post! 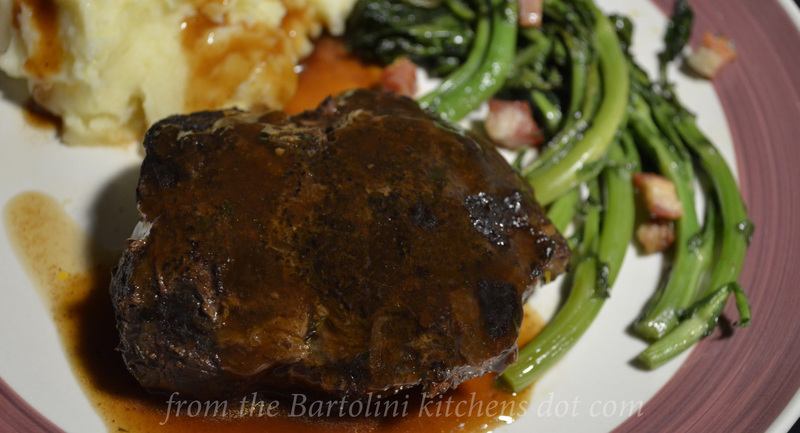 iI always add red wine braised in cooking (Barolo) have you ever tried it? Thank you, Ventis. I’ve enjoyed Barolo but never used it in cooking. I need to try it. I bet it works wonderfully. I hope you have a very special weekend. Wow, this must smell glorious while it’s cooking! This looks and sounds so delicious, and thanks for the side dishes ideas. I didn’t look at your link about the beef recall…I heard about it on the radio today, the reason they recalled and closed the plant. Yuk!! It truly makes me think of going vegetarian. Thanks, Angeline. I rarely include side dishes but these were quite good but so easy to prepare that they didn’t warrant separate posts. I’m glad you liked them. It really is up to us to become aware of where are food is coming from. I try to buy local whenever I can, though it’s nowhere near 100%. Maybe some day it will be possible but not yet. Beef cheeks have become so popular Down Under that I do wonder when we are going to ‘run out’ 🙂 ! I don’t have a slow cooker but make them in a heavy casserole in a variety of ways [even using Asian ingredients 🙂 !] and have managed some soft and tasty dishes. Love your recipe: I normally fasttrack and begin with an ordinary soffrito: have to try your way and remember the madeira! And give me broccoli rabe any day 🙂 ! Thanks, Eha. I really did plan to use my heavy casserole (Dutch oven) but the day was warmer than I thought it would be and there was no need to start up the oven. Besides, it freed up my oven so that I could bake a cake — a real rarity. I am not a baker by any definition. I’ve yet to see beef cheeks at any grocery or butcher shop. I’ve always had to special order them. Now that the cooking shows have discovered them, it will be interesting to see if they start to appear in the shops and whether the price rises. I think I’ll stick with my vendor. He’s local and the meat was properly butchered and trimmed. He’s definitely earned my support. Tender meat, low availability, only can get them from a real butcher shop, by reserving it, as it is with beef tongue. You have prepared it in perfection. My mouth is watering just looking at it covered with the fabulous sauce. The sides are perfect too! Thank you, Fae for you nice compliments. In the past, I’ve always special ordered them because I never see them at any of the groceries or butcher’s. I hope this vendor has them more frequently. He really did butcher and trim them nicely. Today, Thursday, is supposed to be the worst of this cold spell. I hope so. It’s time to bid Winter farewell! Your beef photos practically have me drooling! Then again, they always do. Looks delicious, John. Beef cheeks (and pork ones too) are so good! Unfortunately, our restaurants seem to buy up all the farmers have to sell, so they are very hard to find here. yum! I love how you’re inspired at the market and love even more that you share it with us 😀 Can I say that this is a cheeky recipe or will you block me from commenting in the future? 😉 The meat looks so moist and tender. You eat well! I was in just the place for you today, John. I am sure there were beef cheeks to be had if I had asked for them. So happy to see the gluten free items for my gluten free crew. And I notice you are watermarking your photos now. Was someone copying them? Another polar vortex predicted so will fire up the kitchen. Thanks for all your inspiration in that department. If you can get them, Ruth, you must try cooking beef cheeks. Your Paleo Crowd will love them! I’ve not learned of any of my photos being used without proper accreditation but it is a concern. My recipes are appearing on a few sites now and though those site are OK, I wonder about other sites that may be accessing them, and so on. That vortex is here and we’ve got snow in the forecast for this weekend. Someone please show Old Man Winter the door!!! I gues this is why this secodary beef cut could be pricey in fancy restarant!!! Thanks, Dedy, and you’re probably right. This isn’t an expensive cut but it takes a long time to cook, if you want to do it correctly. That’s slim and sweet of you…. !!! Well, it seems I am not going to be coming for a visit, more like a long term stay with all these incredible recipes John! Scrumptious! One of the best beef cuts, lovely recipe, and going to try you broccoli accompaniment recipe too, thanks. So glad you posted this – it looks mouth-watering. I’ve had little success with my slow cooker, everything seems to come out mushy so it is collecting dust in a cupboard somewhere. BUT I did just get a Dutch Oven that I was going to try this week. Your tips will be very helpful – your post came just at the right time. Thanks! You are in for a real treat. I cannot wait to read your Critics’ opinions. 🙂 As I just wrote to another commenter, if you cannot find beef cheeks — until I found this vendor, I had to special order them — you may wish to try my beef short ribs recipe. It’s written for a Dutch oven and it’s similar to this cheeky recipe. You cannot go wrong with either recipe. Thanks, Judy. You found veal chops! SCORE!!! That is a major find and will be a very special meal. Beef cheeks were meant for a slow braise. They become so tender and succulent. Yum! Yum! Love slow-cooker meals and beef cheeks sound good! That’s cool you were able to get some good quality meat for stocking up in the freezer for the winter! Looks delicious! What farmers market do you go to?? More people should be using beef cheeks! They’re so unbelievably good and these look particularly amazing! Thank you. I think more would prepare cheeks if they could find them. Here, you have to special order them. I was very lucky to find a vendor at the farmers market that had them “in stock”. I don’t do much on Twitter but I’ll give you a tweet tomorrow. Good luck! Thanks, Debra. I knew nothing of the recall either until my Cousin pointed it out. It is great having a relationship with the organic meat vendors but, the problem is, they’re only around from May to the 1st weekend of November. The rest of the year, I’m on my own. I have just learned, however, of a highly-rated CSA that offers weekly home delivery and they, too, have meats. I am going to place an order to see what they’ll send. Looks scrumptious. I first discovered these “cheeks” working in a restaurant. They are indeed the ultimate comfort food – and yours look absolutely delicious in the rich dark sauce. Even though it is early morning, I could eat a plate of these right now…. I’ve only seen them on cooking shows. They’re only available her via special order. I will say, though, that this vendor was prepared them beautifully. There was no need to trim them in any way before cooking. I’ve heard that is rarely the case. That vendor is going to see a whole lot more of me. Wow!!! It looks like beef cheeks are really popular! To be honest, I have never heard of them and it looks like I’m the only one 😉 The side dishes looks and sounds great! Thanks, Francesca. I’m a bit surprised that they are so well-known, too. Here, I can only buy them on special order. I’ve learned about them from the cooking shows, which normally means they’ll become scarce the the price will go up. Time will tell, I guess. Liked everything about your meal. Your version of battuto looks great. Did I spy a baking bag placed into the slow cooker…what a great idea! Less clean-up! Cheeks look fantastic, John, but I don’t think I’ll be able to find them at the Halal butcher! I’ve always wanted to try them but short of getting my own cow, I don’t think I’ll be able to find them. Can’t wait for the chocolate torte!! You’ve always got a new ingredient that I haven’t tried, I will be on the look out for cheeks, but my hopes aren’t too high. How lovely to find something so wonderful hiding in the back of your freezer. If you looked at the back of mine, you’d likely find a dried out old bag of buns. I do need to get organized, if I froze more meats I’d have less grocery shopping to do!! Hey, Barb! You may need to talk to your butcher — even one at the grocery — and order beef cheeks. Until I found this vendor, that’s what I would have had to do. Every time I open my freezer, I say to myself, “I’ve got to clean this thing out!” Instead, I keep stuffing things into it like it has no back. Worse yet, I’ve got another one in the basement and it’s not in much better shape. Yikes! Part of the best stuff during weekends is having great food and this morning, I’m staring at a delicious feast . Thanks. Happy Sunday and all the best to your family. Thank you so much. I hope you and your family are having our own Mardi Gras today. Enjoy! Your meal looks delicious John. The next time I make mashed potatoes I will try it with some parsnips – never thought of doing that before. Thanks, Colline. Do give this mash a try. The parsnips don’t overpower the potatoes but you do know that they’re there. I like it a lot. When I was a child, CJ, my mother cooked a variety of beef parts, such as tongue and heart along with the expected roasts and burgers, but I don’t remember ever partaking of cheeks! Right now I’m craving your potato-parsley mash with some of the cooking sauce. Yummy. Will be pinning. Thanks, Kathleen. (Love your new Gravatar image, by the way). Mom, too, cooked plenty of beef but nary a cheek. I asked my Zia about them and she hadn’t prepared them, either. Too bad because they make a great meal. Yes, those parsnips are a nice addition to mashed potatoes. I’ll be making them again quite often. Ragazzo mio! You are killing me with the goodness here. Oh yes, you are. And I thank you anyway. the hungry dad loves beef cheeks. Will have to remember this recipe for when the weather gets cooler here in Sydney. Thanks for the reblog. I really do appreciate your support. Beef cheeks are one of my favourite things… actually, make that ANY slow cooked meat! These look delicious John. Glad that you managed to find some from the organic meat stall at the market! My local farmer’s market also sells organic capretto which is wonderful. Never knew how good goat could taste until I tried capretto! Anyway, I am definitely going to try this recipe as soon as the weather cools down a bit here. It’s now officially Autumn but still in the 30’s (celsius). Thanks John! Once again you’ve tempted me with a dish I’ve never tried … I’m adding beef cheeks to my culinary bucket list! Delicious! It’s getting colder here, so some of this would be good for dinner right about now. How important is it to turn the cheeks over throughout the cooking time, and has anyone not followed that part? I ask because I would normally put my slow cooker on before going to work, and I wouldn’t be home to turn them…. I think it is far more important to turn them when braising them in the oven, where the temperatures are higher. Though I’ve never left them “alone” all day in the slow cooker, I bet they’d be fine. Just make sure to turn them as soon as you can to prevent the exposed portions from becoming too dry.